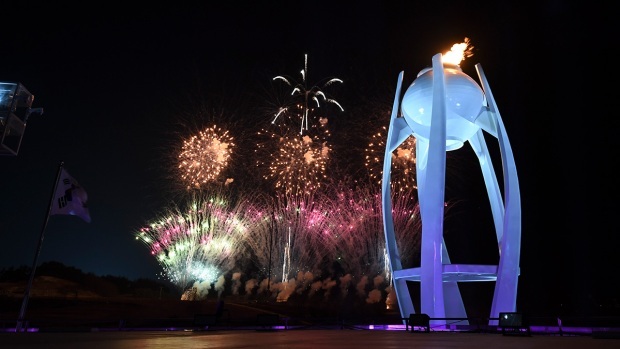 The 2018 Winter Olympics in Pyeongchang came to an end Sunday with a spectacular closing ceremony that included an electrifying performance by a 13-year-old guitarist and another shirtless appearance from Tonga's Pita Taufatofua. Yang Tae-Hwan, a 13-year-old electric guitarist, rocked the Olympic venue with a variation on "Winter" from Vivaldi's "The Four Seasons," according to The New York Times. Performers in glowing suits danced around the teen prodigy, then 80 traditional Korean instruments joined the rock guitar arrangement. 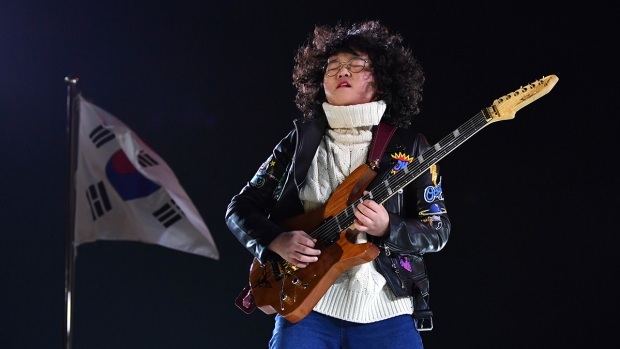 Thirteen-year-old guitarist Yang Tae-hwan plays a variation on 'Winter' from Vivaldi's The Four Seasons, during the closing ceremony of the 2018 Winter Olympics in Pyeongchang, South Korea, Sunday, Feb. 25, 2018. 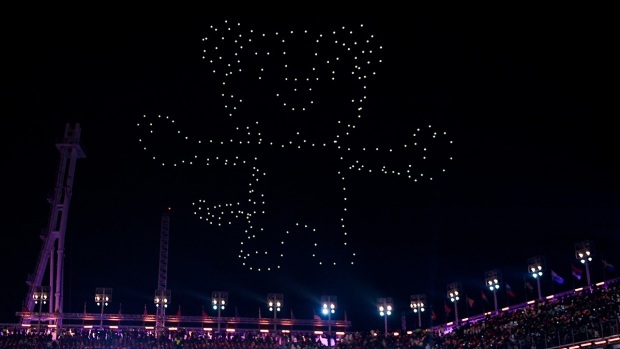 Drones formed the shape of Soohorang, the beloved mascot of the Pyeongchang Games, in the sky, high above the stadium. Then a heart appeared around the mascot while it waved a final goodbye to the Winter Games. Drones light up the sky in the shape of the Pyeongchang Winter Olympic Games mascot, a white tiger named "Soohorang" during the closing ceremony of the Pyeongchang 2018 Winter Olympic Games at the Pyeongchang Stadium on Feb. 25, 2018. 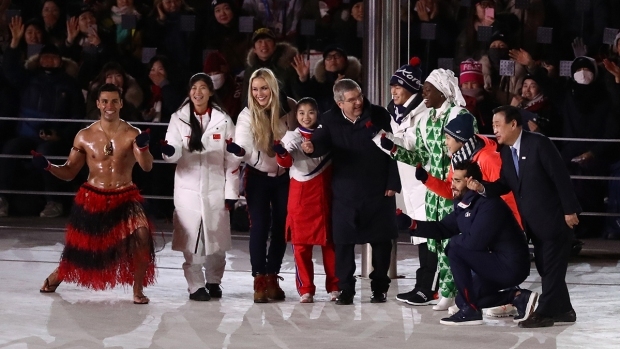 IOC president Thomas Bach invited several known athletes, including USA's Lindsey Vonn and Tonga's Pita Taufatofua-- who showed up oiled up and shirtless for his fourth consecutive Olympic ceremony--to make a "finger heart" gesture. The crossed thumb and forefinger isn't too well known in the U.S., but it's a well-known symbol among Korean pop stars and their fans and stands for love and more. Taufatofua, wearing a grass skirt and a pair of warm gloves, posed with Bach and other athletes for a group photo while making a finger heart. President of the International Olympic Committee Thomas Bach and Lee Hee-beom, President & CEO of PyeongChang Organizing Committee stand on the stage with Lindsey Vonn of the United States, Pita Taufatofua of Tonga and Olympic athletes during the Closing Ceremony of the PyeongChang 2018 Winter Olympic Games at PyeongChang Olympic Stadium on Feb. 25, 2018 in Pyeongchang-gun, South Korea. One of South Korea’s most popular female artists made an appearance with a Super Bowl halftime-esque performance complete with torches and dancers. CL, real name Lee Chae-Rin, lit the stage literally and figuratively with one of her greatest hits, "The Baddest Female" and "I Am the Best." From panda bears to K-pop, the closing ceremony of the Pyeongchang Winter Olympics rocked. After Bach announced the end of the Winter Games, South Korea’s K-pop boy band Exo hit the stage. One of the nine members wore traditional Korean clothing and started the performance playing a Korean instrument. The rest of the group joined in white suits as the audience cheered one of the country’s most popular K-pop groups. The hashtag #Olympics_EXO was trending on Twitter in the U.S., with over one million tweets even before the closing ceremony began. Russian figure skating silver Olympic medalist, Evgenia Medvedevа, a self-proclaimed Exol (what Exo fans named themselves), posted a photo of her with Exo before the closing ceremony began. They were all making a finger heart. During the parade of flags, North Korea and South Korea athletes carried their own flags rather than carrying the Unified Korea flag that was seen throughout the Games and during the opening ceremony. Speedskater Lee Seung-hoon carried South Korea's flag and figure skatber Kim Ju-sik carried North Korea's. Meanwhile, Russia's flag was still not allowed at the closing ceremony. Russia was banned from the Pyeongchang Olympics because of state-sponsored doping at the Sochi Games in 2014 but its atheletes were allowed to compete under the name Olympic Athletes from Russia. North Korean athletes walk ahead of South Korean athletes as they march into the stadium during the closing ceremony of the 2018 Winter Olympics in Pyeongchang, South Korea, Sunday, Feb. 25, 2018. 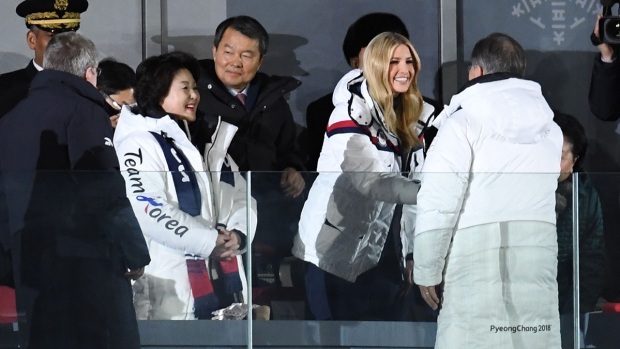 South Korea’s President Moon Jae-in and Bach shook hands with Ivanka Trump, the daugther of President Donald Turmp, and others around her when they arrived at the ceremony to be seated in the same box. Ivanka Trump lead the U.S. delegation to the closing ceremony and spent two days meeting athletes and attending events, including USA’s gold medal match in men’s curling. The presidential adviser was seated in the VIP box with a top North Korean official. Kim Yong Chol, vice chairman of North Korea's ruling Worker's Party Central Committee, sat behind Trump, who was smiling as luminaries were introduced. She did not appear to interact with the North Korean official on camera. Meanwhile, Team USA's freestyle skier Gus Kenworthy criticized Trump's apperance at the Olympics in a tweet. "So proud of all these people! Everybody here has worked so hard to make it to the Olympics and have the opportunity to walk in the closing ceremony! Well... Everyone except Ivanka. Honestly, tf is she doing here??" South Korea's President Moon Jae-in (R) shakes hands with US President Donald Trump's daughter and senior White House adviser Ivanka Trump during the closing ceremony of the Pyeongchang 2018 Winter Olympic Games at the Pyeongchang Stadium on Feb. 25, 2018. The closing ceremony turned into a big nightclub party at the end with a performance by Martin Garrix. 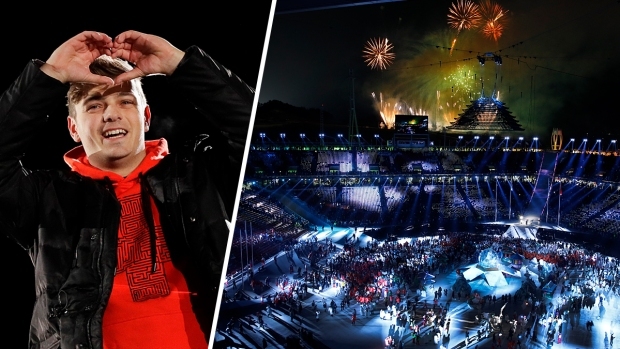 The Dutch DJ announced he'll help close out the Winter Games in an Instagram post Saturday. "Can't believe I get to close The Olympics tomorrow," he wrote. "I was watching The Olympics in 2004 with Tiesto opening the event which inspired me to do what I do today. Being part of the closing ceremony tomorrow, I can only hope and dream that I can inspire someone the same way he did. Life is crazy." Garrix's electronic music was punctuated by a volley of fireworks. DJ Martin Garrix from the Netherlands gestures during the closing ceremony of the 2018 Winter Olympics in Pyeongchang, South Korea, Sunday, Feb. 25, 2018.